More Gold Diggin' Online 3D Video Slot by BetSoft Gaming. Prospecting-themed online slots usually provide players with some of the best thrills you can shake a stick of dynamite at. 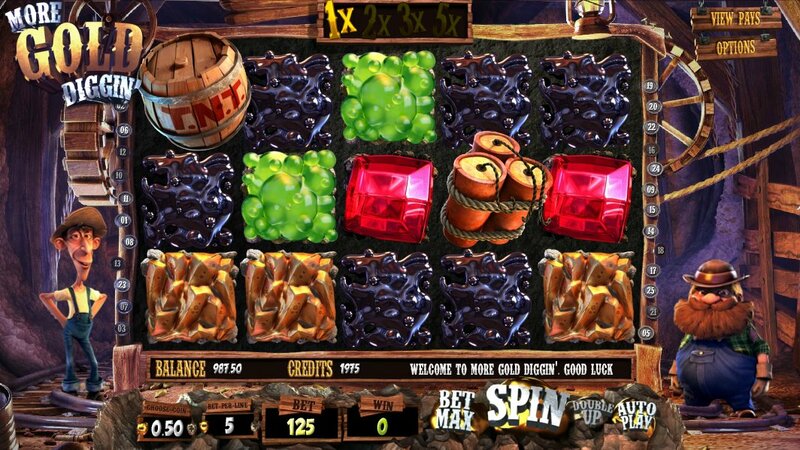 Betsoft Gaming - the 3D pioneers behind slots like the predecessor to this slot Gold Diggers and the equally as barmy Black Gold slot - like a bit of darn tootin' Wild West action, and with More Gold Diggin', they may have served up the best yet. Like some of Betsoft's other 3D online slots, the slot - here a 5-reel, 25-payline one - has at its heart some quirky characters. Our bearded prospector and his goofy assistant are helped on the reels by a gopher who pops up in front of the reels. Here's where the slot differs from its rivals, however - the reels don't 'spin' as such; rather, the symbols fall - 'cascading reels' style - onto the reels. Winning combos then explode from the screen. Look to the top of the game screen as you'll find there an increasing multiplier. This multiplier will apply to the win at that time. With a first explosion you get a 1x multiplier, a second winning explosion sees the multiplier go up to 2x, then 3x and finally, 5x. After each exploding win, the symbols above fall into their place and help form potential new winning combinations. 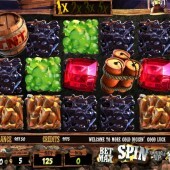 In the free spins round, here triggered by three TNT Scatters on Reels 1, 2 and 3, multipliers also increase for every win - 3x to 6x to 9x to 15x. This makes for a very interesting free spins bonus round. As for symbols, the top payer is the blue diamond that pays $12,500 at the top coin bet when you hit five on the reels. Elsewhere, there is gold, platinum, quartz and rock on the reels, as well as the Wild dynamite icon that subs for all regular symbols other than that Scatter. Betsoft never skimp on bonus features and they are certainly not here in More Gold Diggin'. Although the free spins is the only bonus round in the game, the thrills are more than provided by the exploding symbols and increasing multiplier on all wins. More Gold Diggin' is definitely another winner for Betsoft - who's up for a bit of prospecting?